Day 1 - Bombay to Kopu, Paeroa, Waihi, Whangamata, Whitianga, Coromandel to Waikawau Bay. 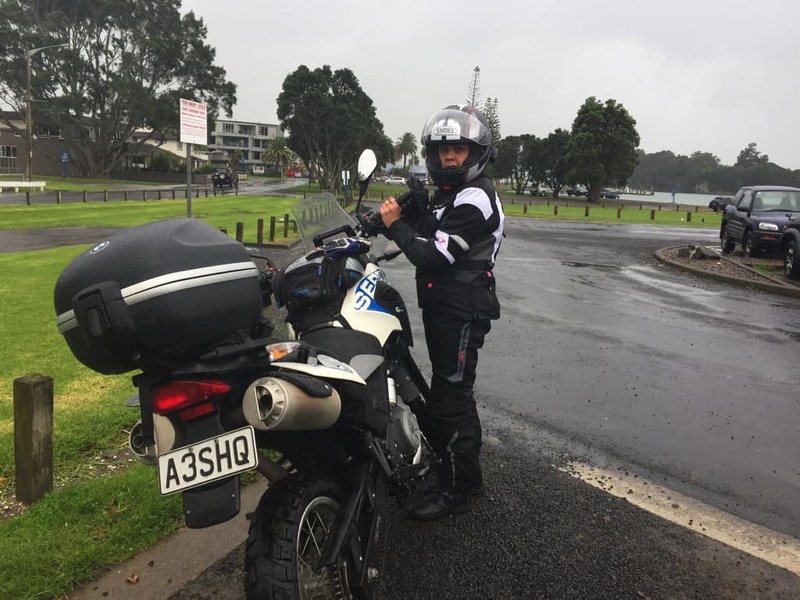 Up at the crack of dawn to a still and overcast morning – cuppa tea in hand, I was eager to get on the road to start my first adventure bike experience. Double checked my overnight luggage that I’d packed the night before – space is very limited for 2 people on the one motorbike so you need to select clothing that can easily be rolled up in a compact manner and can fit into a compartment about the size of a shoebox – jeans, t-shirt, long sleeved top, change of underwear, some shoes that are too bulky and your toiletries, oh and your togs (as per Dave’s suggestion) as you never know when the opportunity arises to take a dip in the sea or soak in some hot pools somewhere along the way.. Definitely no room for your favourite pair of funky boots or your hair straighteners, they belong at home….this is about going on an adventure after all ! So putting on my brand new bike gear for the first time I’m feeling pretty special, this was for real – not just a practice run this time! 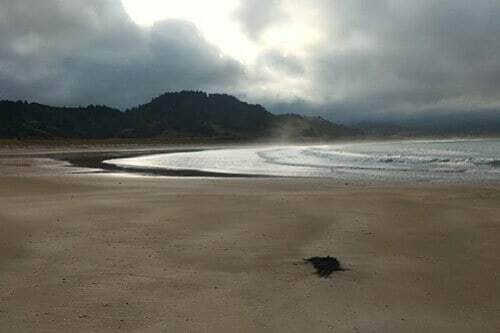 Uncertain of how cold / warm I will be today – the weather forecast was pretty murky heading into the Coromandel area for the first day but bright sunshine for the 2nd day. As per Dave’s advice, I elected to layer under my motorbike gear , leggings, t-shirt, merino long sleeved top and of course nice long socks. Probably the hardest thing was getting used to doing up my boots with my ‘armoured’ jacket and pants limiting my movement to bend down. Something I’ll get used to no doubt.and something a couple more regular hot yoga sessions won’t go a miss. Fresh out of the driveway and turning up Paparata Road to head East rather than using the motorway route to SH2 Coromandel. I had my helmet visor right down which to my surprise had it quickly steaming up to the extent that I couldn’t see much, at the same time Dave was asking me whether my intercom microphone was near my mouth as he was having difficulty hearing me. Felt just a tad overwhelmed given I couldn’t even see the road in front of me let alone locate where my mouthpiece for the microphone was! Obviously a simple little feature I’d missed before heading off on this crisp morning combined with my excited steamy hot breath was opening the standard vent located at the front of the helmet before heading off to prevent such a helmet steam up from happening. Fumbling around trying to locate exactly where this was while on the back of a bike, in addition to Dave still trying to communicate with me proved to be a challenge and anxiously I also didn’t want to be a distraction to Dave who was concentrating on riding. Stopping on the side of the road was necessary to sort it out and we eventually got underway again. 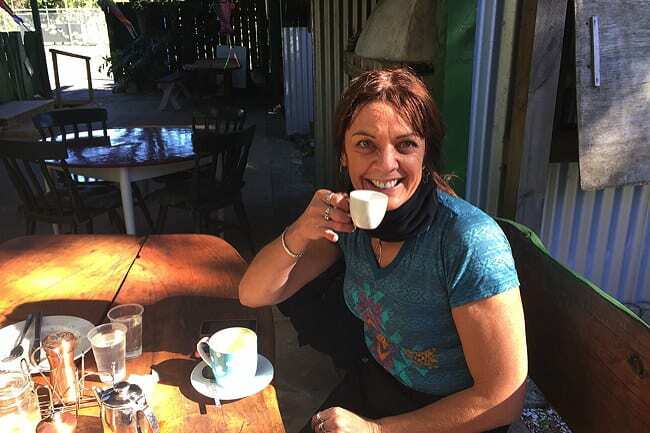 First stop for our first coffee of the day was the Bugger Cafe at Pipiroa (a couple of kms before the Kopu bridge). 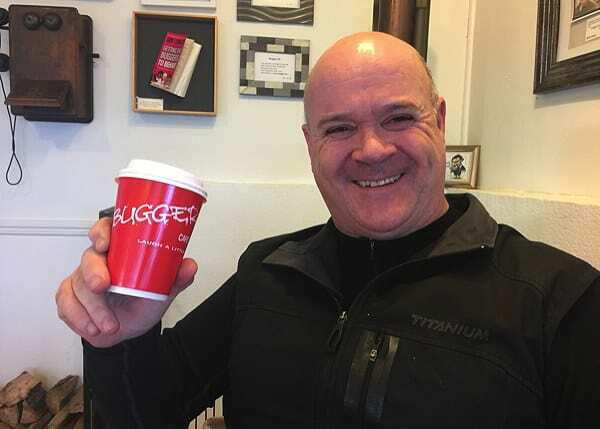 www.buggercafe.co.nz. Highly recommend a refreshment stop at this quirky cafe… very cleverly based around the édgy’ word or expression – “Bugger”. The Cafe offers friendly staff, tasty food, good coffee and is adorned with photos of “bugger’ moments which create quite a talking point. The room to the right of the food counter has a log fire and a TV screen with rolling footage of more ‘bugger’ moments to entertain you during your stay. Make sure you visit the toilets and check out the mirror! Their motto of “laugh a little @ Bugger cafe” certainly worked for us and made our date scone and coffee experience extra special. 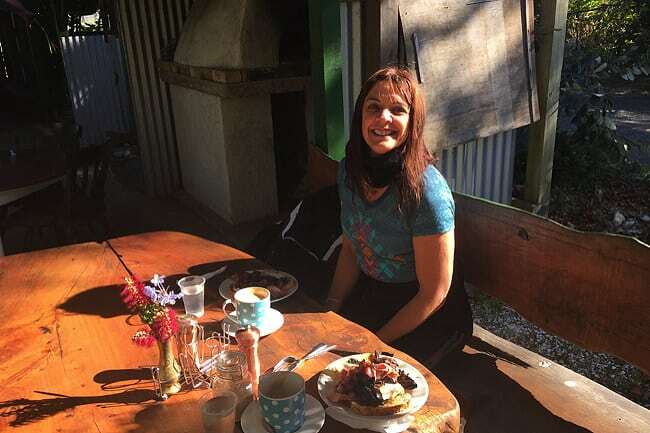 Nice and warm, my gear now feeling good, and with the morning sun starting to shine through, we headed across Kopu bridge and taking a right onto SH 26 through to Paeroa… ah this is the life! 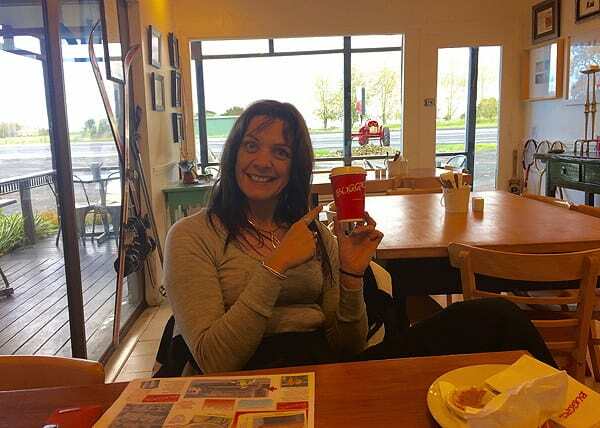 A couple of things I had done during our coffee stop was to adjust the clip settings on my motorcycle boots as my toes were starting to feel a bit cramped and tingly – just a simple adjustment to loosen the lower of the 3 clips and it had my little peepers feeling normal again. Another welcome adjustment was the addition of a woolen neck wrap that Dave had given me to try. While his jacket collar came up higher and hugged his neck, the neckline style of my jacket left just a little row of exposed skin which during long rides could prove to be a little uncomfortable. Hardly any traffic on the road, it was a great ride up and down gentle hills, chatting away on our interphones which were now working perfectly. We passed through the cute little settlement of Matatoki which used be the backbone village supporting the Kopu sawmill but this closed in 2008 with a loss of 145 jobs. Now the area is perhaps better known for organic cheese making with “The Cheesebarn’’ offering a licensed cafe and cheese tastings www.thecheesebarn.co.nz. We hadn’t scheduled a stop as we’d not long got back on the road again after our coffee but could be worth checking it out next time we’re through that way. Didn’t seem long at all and we were already in Paeroa. It’s a little hard to describe but passing through the countryside and townships on the back of a motorbike makes you more aware of your surroundings and you seem to naturally take notice of more things, names of places etc. While I don’t speak Maori (only basic greetings and being able to count to 5 in Maori), I am always curious on the history of NZ place names and their meaning and use this as a way of increasing my Maori vocabulary somewhat. Paeroa for instance has the meaning of ‘Pae’ = ridge, ‘roa’ = long. Day one began at 8:15am with an estimated 4hrs 49min and 287km of riding ahead to reach our destination, Waikawau Bay. After stops for coffee, brunch, toilet and warmups, and some small detours, we arrived at our AirBnB at 5:15pm, having clocked up a little over 300km. We feel it is important to map out our rides on Google Maps prior to leaving so that we have an idea of times, and distances. Doing this allows us to make small changes yet still arrive at our destination around the times we originally plan. Lynley had called ahead to the AirBnB to say we would be arriving around 5pm so they were suitably impressed that we arrived within 15 minutes of our estimate. 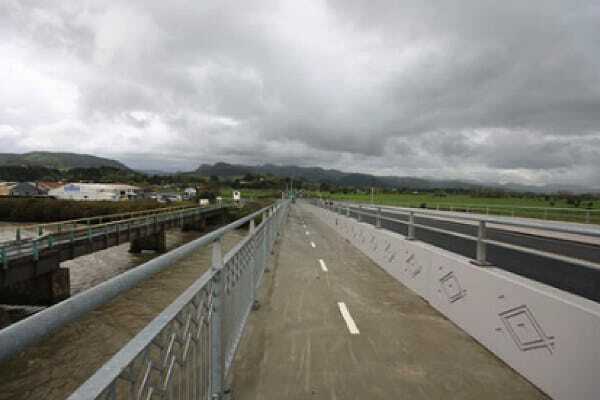 In contrast when recently on a ride to the “Bridge to Somewhere” in Whangamomona, we underestimated the time to complete the ride to the bridge and back to the hotel by more than 2 hours. Read about this ride here…. On route to Waihi on SH 2, we rode through the Karangahake Gorge. This was spectacular on a bike and I found myself having many “wow” moments when commenting on the scenery. We decided to develop a rating system of how great each leg of the journey was based on how many times one of us would say ‘wow’ as we rode through the various landscapes. The gorge has steeps of gold mining history and its historic walkway/bike tracks follow the old railway line that was once between Paeroa and Waihi townships. The tunnels, bridges and tracks along the beautiful Ohinemuri River would make it a fantastic mountain bike ride….another something to add to my ‘must-do’ list. Learn more here…. Once through Waihi, the weather seemed to change and going through the gullys and around corners we were greeted by strong gusts of wind which was initially a little scary on how much they can move the bike around when they come at you from the side. Total trust in Dave’s riding ability though and heaps of previous experience in all riding conditions put my mind at ease. Today though, Whangamata was not a beachy party town and with the grey skies opening up with some heavy drops of rain, everyone that was out and about were heading to the many cafes of Whangamata. We elected to go to Vibes cafe on the main street for our brunch stop. We were able to park the bike right outside and sit at a window table so we could keep an eye on it. The cafe was warm and offered a good range of food. We stayed here a little longer than expected as we were contemplating our next leg of the journey which would involve rain of some sort. 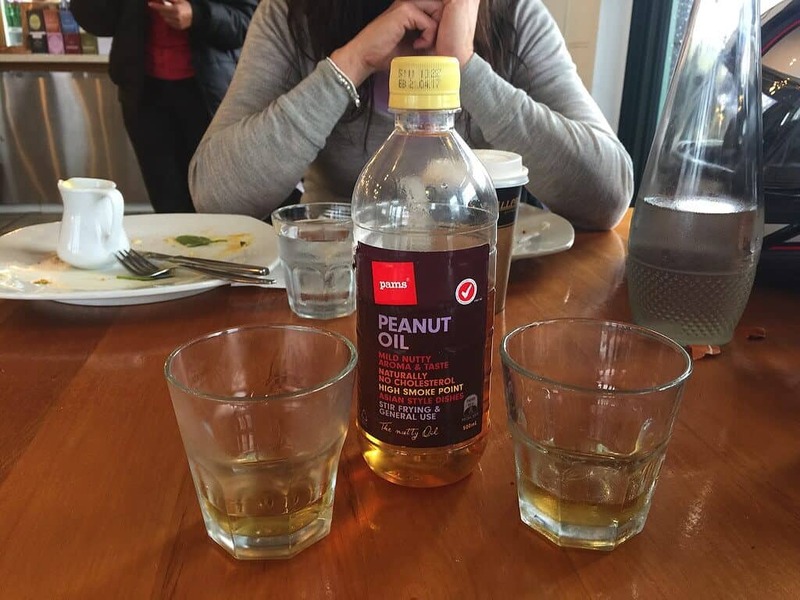 To assist in the preparation, we enjoyed a little extra warmth from Dave’s secret ‘tonic’ of ‘Peanut Oil’. We stayed in Whangamata a little longer than expected as we were contemplating our next leg of the journey which would involve rain of some sort, and plenty of wind. To assist in the preparation, we enjoyed a little extra warmth from Dave’s secret ‘tonic’ of ‘Peanut Oil’. The secret recipe of this amazing tonic will be available for those who subscribe to our email list for updates on our next adventure. Back on the bike, we headed on SH 25 through to Tairua onwards to Whitianga. 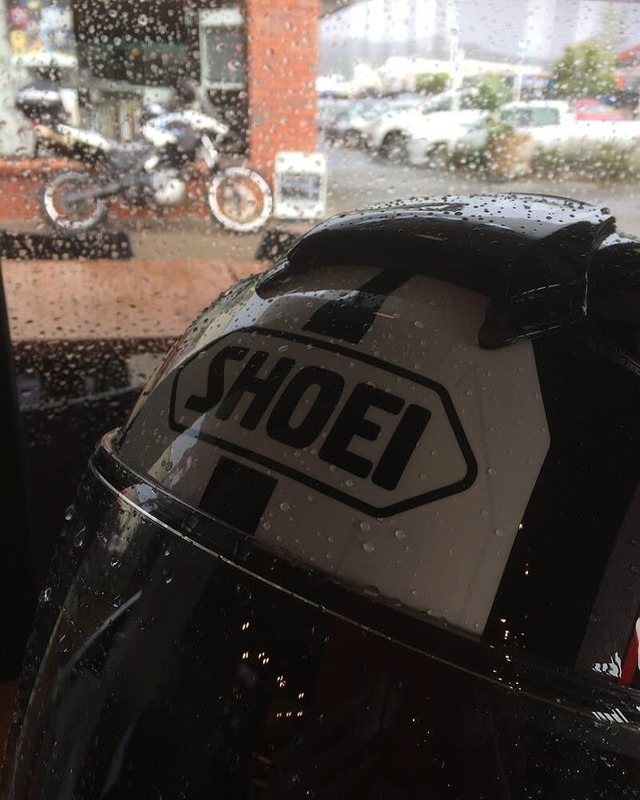 We had originally planned to have a squiz at Hahei but with the light rain now turning into very heavy rain, we decided to keep pushing onto Whitianga. Something I learned was a change of itinerary should always be expected when going on an adventure bike ride as weather, road or hunger/loo stop conditions can always change! This leg of the journey I was again a bit anxious as the roads were slippery and the driving rain seemed to be getting worse and when Dave acknowledged that it’s raining hard, then yes it was raining hard – Dave is a guy that does not exaggerate! I noticed he went a bit quiet on the inter-phone and I realised he needed to concentrate hard on the riding safe to the conditions and this was TOTALLY ok with me !!! I still remained dry in all my gear with the exception of my gloves now filling up with water and I realised the reason for this was that I was wearing my gloves on the outside of my jacket sleeves and the rain water was pouring off the bike jacket down the sleeves and dripping directly into my gloves…… hmmm a lesson learnt for next time’s rainy conditions. When we came across a fallen tree down right across both lanes of SH 25, it really sunk in that we were indeed, riding in extreme conditions. Locals or drivers of the blocked vehicles were attempting to break off branches and drag them off the road to allow at least one lane to be freed up to cars to pass. Not an issue for us though on a motorbike… we just manoeuvred our way past the blocked vehicles and around the tree and we were back on our merry way – must admit it did feel good waving out to the drivers of the cars as we headed on past. We arrived at Whitianga and the rain subsided. We were due for a loo stop so rode to the Marina. Mercury Bay inlet was lovely and calm and there were some impressive yachts moored there. 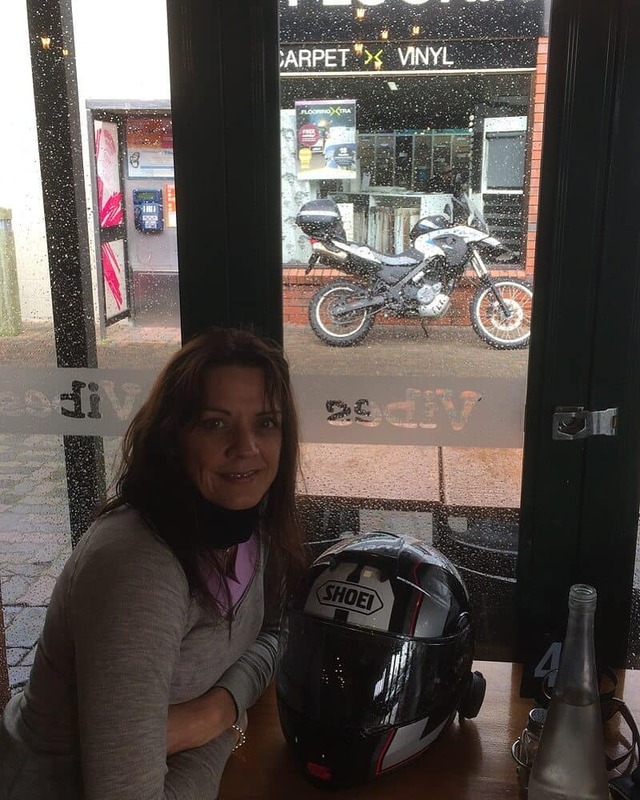 It was great to dismount the bike and have stretch my legs… I think your body tenses up a bit when weather conditions challenge you – it was also good to take my gloves off and give them a bit of a wring out to clear some of the water. Dave and I keep our helmets on but with the flip top up so we could slurp some water and talk… it was funny keeping the interphone on as we went into the separate Mens/Womens toilets and were able to keep talking to each other as we went about our ‘business’. The range of these helmet interphones is about 500 metres apparently. I gathered that we had now entered a new stage of our relationship being comfortable talking while on the toilet. Quick loo stop complete and back on the bike to press on. Despite the rain stopping, the weather was still a bit dodgy and we were eager to get to our AirBnB accommodation at Waikawau Bay. Again we had originally thought we would stop off at Kuaotunu or Matarangi but decided to head straight to Coromandel where we would need to stop for petrol. liquid refreshment of some sort. 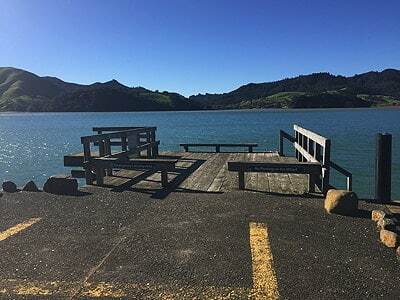 The scenery of Whitianga – Coromandel SH 25 was beautiful, the road winds up quite high, giving spectacular views of the Whangapoua Harbour before heading down into Coromandel township. 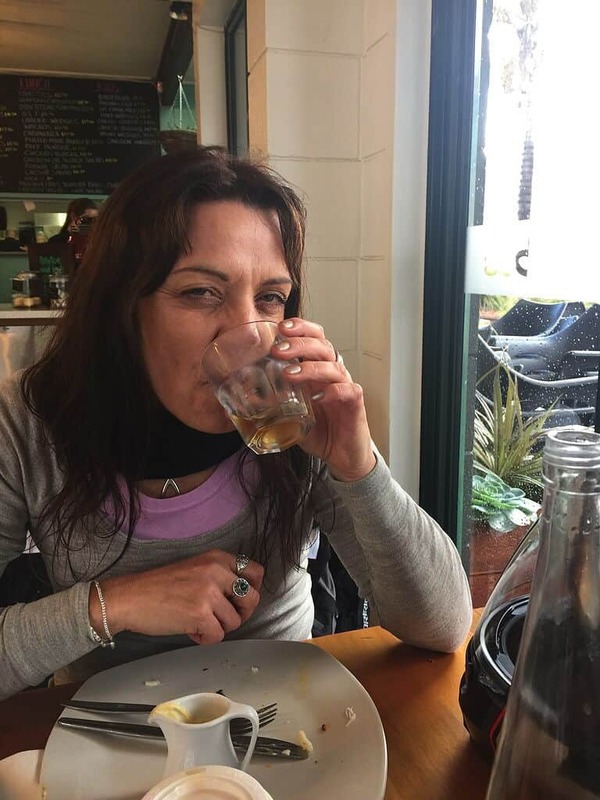 With the worst of the weather behind us, we were more relaxed, chatting more and making the excellent decision of having a well-deserved liquid refreshment of some sort at a Coromandel pub. Filled the bike up at the petrol station = $20, another ‘wow’ moment of how little it cost compared to a tank of gas in the car. Next stop The Admirals Arms Hotel which is classic historic hotel close to the Coromandel wharf. This was the best stopover yet! A warm fire with a ledge around the fireplace to balance our drinks on and dry out some clothing – this space had our name on it and no-one was going to take it. I hadn’t realised just how wet and cold Dave had got – being the forefront of the opposing weather and not having nice new flash gear like I had resulted in him getting soaked to the skin. I realised how lame it was for me to be complaining about having wet gloves compared to what he was experiencing from his well worn and older bike clothing. Technology of bike gear is improving all the time and a new bike jacket for him just shifted up on our priority list. Hanging out around the fire with the friendly locals and a couple of Jamesons & Dry was an awesome way of reflecting on our ride and how much ground we’d covered since leaving Bombay that morning – could’ve stayed there for longer but wanted to arrive at our accommodation before dark. Grabbed a bottle of red wine for later which thankfully was able to be squeezed into the top box case on the bike, either that or I would zip it up under my jacket front as we didn’t have too many km’s to go… there was no way we would be leaving that wine behind! Feeling so much warmer now and time again to mount that bike which I must say is getting easier. Day one almost over and I’ve already experimented with the various methods of mounting a motorbike…. Because of the hard top box sitting high on the rear of the bike, you are unable to swing your leg over the bike as I could normally do. So ‘Method 1’ for me is to face the left hand side of the bike, step back a couple of steps, kick your right leg forward and up at 90 degree angle to touch the seat of the bike, then continue the movement in a sliding manner turning your body sideways into your final straddle position on the back of the bike. The flow of the mount improves with practice especially getting used to the restricted range of movement you have in your padded/armoured bike gear.… the odd occasion had me misjudging my kick up and clipping the bike and aborting the mount which caused a bit of hilarity.. Fortunately I didn’t have an audience watching at the time. Experimented with my ‘Method 2’, this time using the left hand side foot peg as my launching pad – as I thought this would give me enough height to swing my right leg over the back of the bike to clear the box case. Quite hard to get enough momentum to smoothly swing your leg over so success rate not as high as my ‘method 1’ and could be quite spectacular if it fails so I’ve decided to master my Method 1 mounting technique with my dismounting being the exact reverse of movements. Oh and I do have another option, but my ‘Method 3’ is very much dependent on the location of where you’ve stopped and it 100% relies on what props you can find to take advantage of to assist your mount and dismount, eg park bench seats, big flat rocks, high gutters, etc. 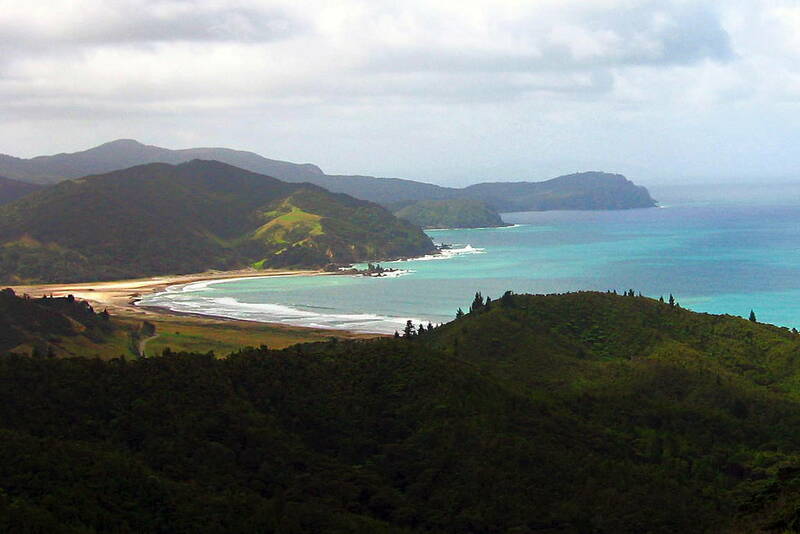 Back to the final leg of the day’s journey – Coromandel to Waikawau Bay. There are 2 ways to get there one going through Colville which seemed a little longer on the map and one via Kennedy Bay. 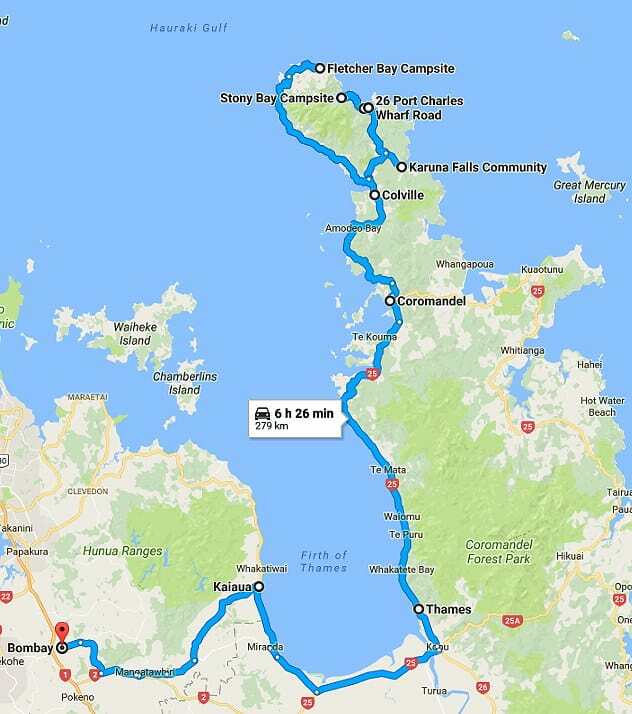 We were intending to cover both of the routes either arriving or departing from Waikawau Bay so headed North East on the road to Kennedy Bay. As soon as you turn off, it is a gravel road winding up and over a ridge down into a valley before passing by Kennedy Bay. Very few cars on this road! The gravel road was damp from the previous rain which was good as very little loose gravel. 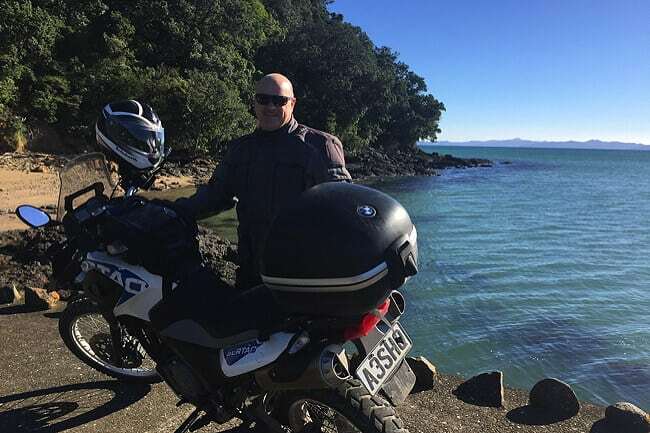 I enjoyed this ride as had never been on this very remote side of Coromandel Peninsula – amazing isolated beaches, flagged by a handful of houses/baches – a very remote part of NZ, no dairies, cafes, or petrol stations out here!. 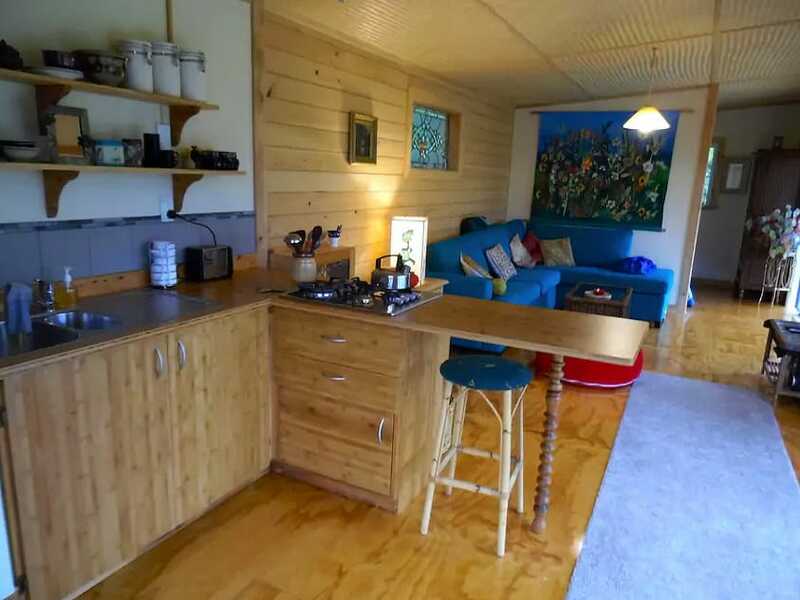 Our AirBnB accommodation for the night is within the Karuna Falls community at 233 Waikanae Valley Road – this eco-community was established about 40 years ago and is now a cooperative society and very much self sufficient using off the grid forms of electricity and waste management – and what did that mean for us ? Solar powered shower and self-composting toilet. So It was close to 5 pm when we arrived at our host’s cottage – access was down a couple of kilometres of overgrown driveway – could’ve been a little hard to find if we had arrived in the dark. Tonight we were staying in at Barbel’s self contained cottage. 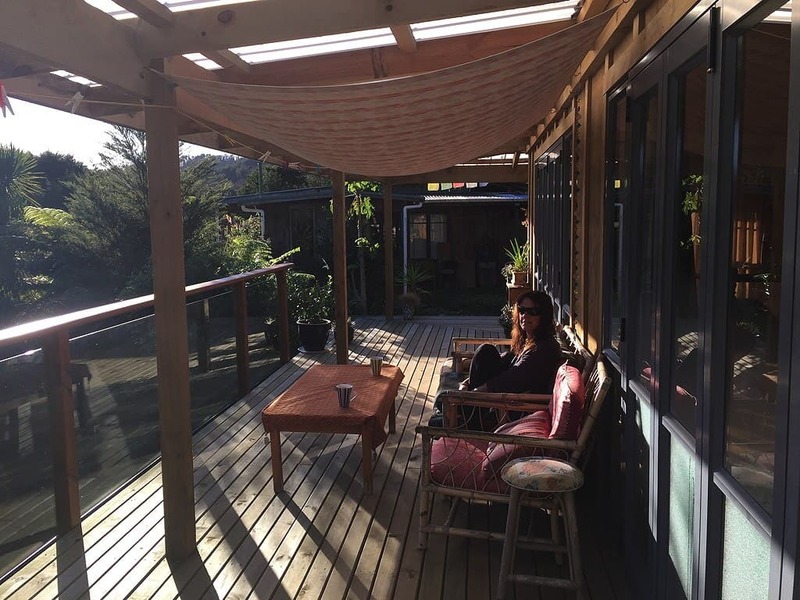 Barbel is originally from Germany but has lived in NZ for over 30 years, she is an amazing textile artist and her work is featured on the walls and furnishings in the cottage. 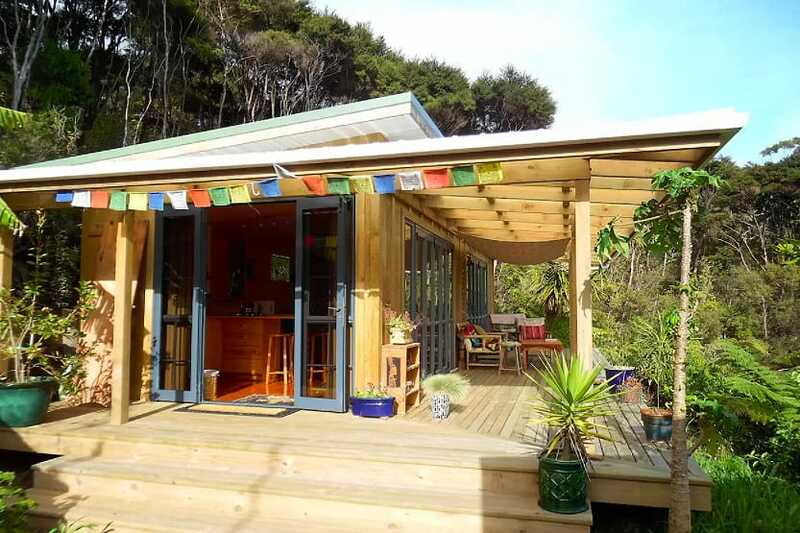 The wooden cottage setting was really cool as it was elevated and featured a large deck looking over native bush. The only downside was that the one thing that we really really needed was a lovely hot shower to warm up with after our damp ride and unfortunately the solar shower would’ve only offered a very luke-warm splash. Barbel offered an alternative which was showering down at the community centre but we were just so tired and hungry that we flagged that idea. Instead we got changed, put the heater on full and drank some more of that magic ‘Peanut Oil’ while we waited for dinner. Barbel offers a home cooked meal (additional charge of $25/head) which was welcomed. Our meal was a big pot of delicious Thai Chicken Curry with rice, followed by Fejoa/Apple crumble. We scoffed the lot and it was just the ticket to warm us up from the inside out. Slept very well that night, comfy bed and don’t forget to check out the stars before going to bed – no light interference out in this remote piece of paradise. To Check out Barbel’s Cottage – Click Here…. After a cold, wet and windy, but exciting day we couldn’t wait to get warm and dry for the night! 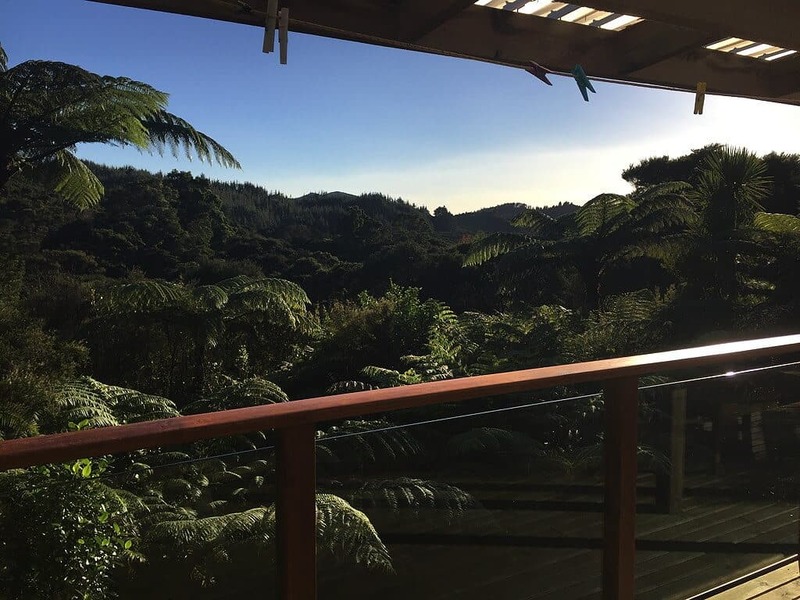 At Karuna Falls AirBnB we woke up to brilliant sunshine and an awesome view! Slept really well last night and awoke to start my 2nd day of adventure. A beautiful, still and clear morning with the weather forecast predicting a sunny Autumn day, I was ready to go ! 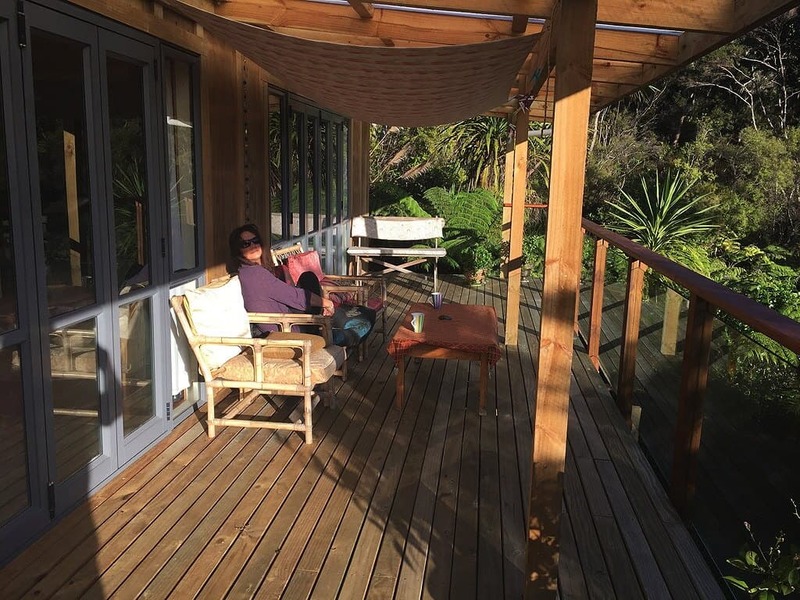 After some brief relaxation sitting on the deck with our traditional morning cuppa in hand, enjoying the morning sun, bush and native birds, we geared up and packed up. 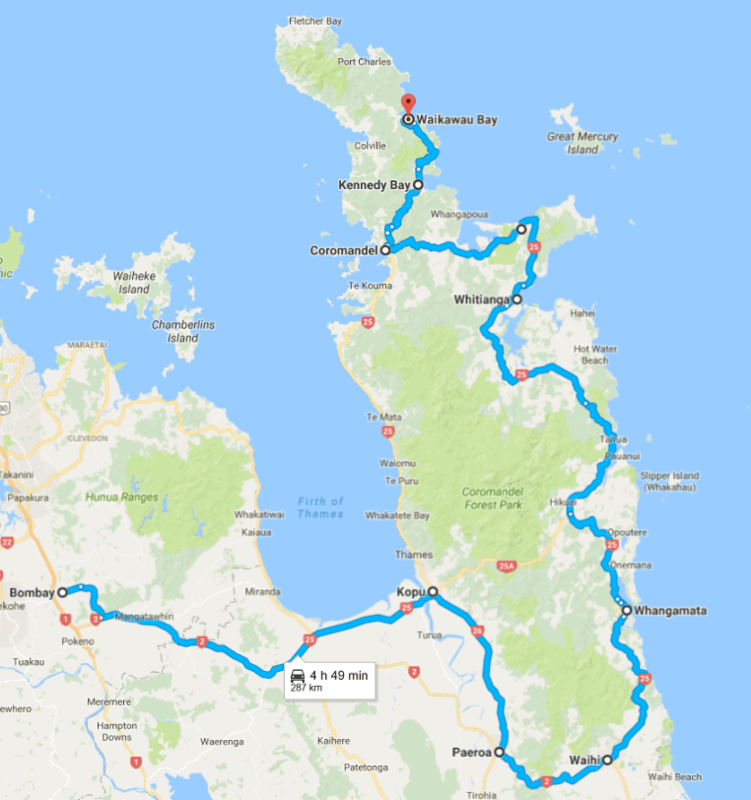 We were to head up the North Eastern side to Port Charles, then zipping up as far as the road takes us to have a look at Stony Bay – a total of 22 km’s but travel time was close to an hour due to the nature of the gravel road. I was looking forward to covering this bit of country as I’d never been up this side of the Peninsula before. Turning left out of the Karuna Community driveway, and soon after passing through the junction to Colville, it didn’t take long for the road to narrow and start climbing up and over a ridge before arriving at Port Charles. It’s worth popping down to have a look at the Port Charles wharf and get absorbed in the expanse of the harbour inlet and check out the number of boat moorings. 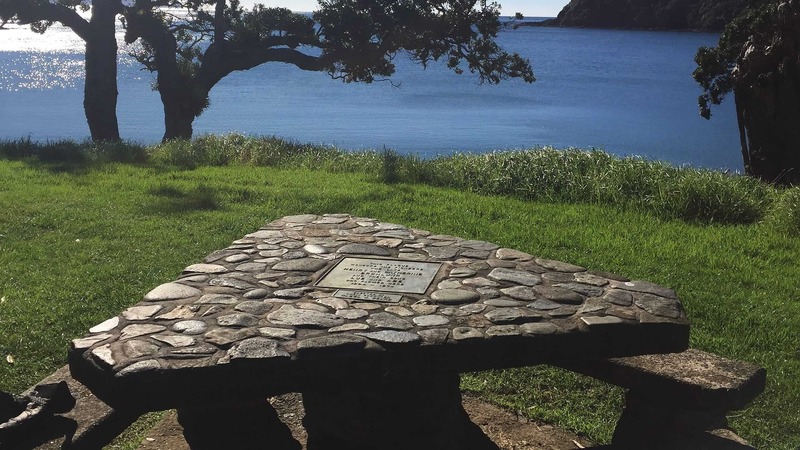 There is just a wharf here with no actual boat launching ramp – apparently James Cook sailed into Port Charles wharf on 18 November 1769, stocking the Endeavour with fresh water before continuing into the Hauraki Gulf and sailing up the Thames River. An interesting fact though is that there is uncertainty around the relevance of the name “Charles” in this place name. Continuing on and just around the corner to the next bay is “Sandy Bay” which is a lovely sheltered stretch of beach and small beach settlement – looked like a beautiful spot for a holiday house if you prefer a bit of isolation and can handle the road getting there. Next it was onwards and upwards through steep rugged hills with some tight corners thrown in for some fun…….. fun on a bike that is, but extremely hard work for the odd car or campervan that we met along the way struggling to hold their position on the narrow road. 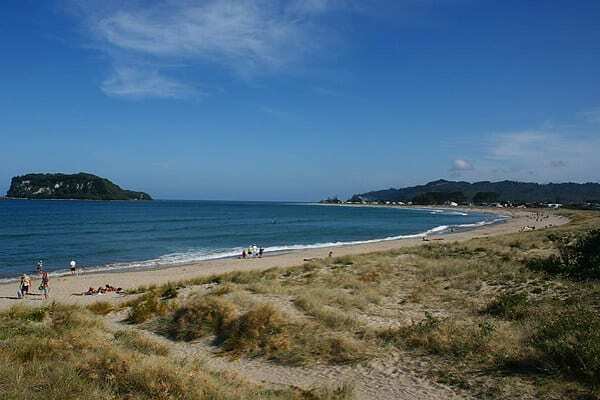 A few more kilometres on, we came to our first big “wow” moment of the day which was our first sighting of Stony Bay. Prior to this, the road had headed inland through bush and away from the coastline and coming out into an elevated clearing from previously having native bush on both sides of the road, we hadn’t realised how high we were. The view before winding down into Stony Bay itself was awesome. 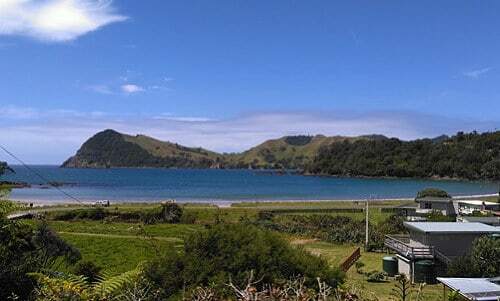 The bay is a hidden gem, a piece of paradise, so flawless and unspoilt. Obviously as it’s place name suggests, it is a stony bay but with pristine, crystal clear sparkling water. There was an abundance of driftwood on the beach which added to the overall textures of the land and seascape. Adorning the beach was a large driftwood heart that someone artistic had very cleverly created – very cool. The Dept of Conservation campground was really lovely as it was spread out and split leveled, offering a variety of camping spots including one bach that sleeps 5. The toilet facilities looked fairly new and modern as well. There were just a handful of campers at the site today plus a lovely super-friendly duck who came and said hello while we were taking some photos and video footage. Didn’t really want to leave Stony Bay on such a beautiful day but we had more ground to cover and with only a cuppa tea under our belts first thing this morning, we were starting to get a hunger on. So it was back-tracking on our return journey as far as the Colville Road junction – and this didn’t seem to take as long as the journey into Stony Bay, weird how that is always the case! Coming into Colville we came across a herd of cows on the road being transferred to a paddock some distance down the road. Reminded me of my childhood days down in the Manawatu – all quite common to encounter livestock on the roads surrounding Palmy North and obviously something you don’t get living in Auckland. We rode behind the herd for while alongside the farmer on his bike – he didn’t seem that friendly though and with our senses working overtime with all the cow smells, we zipped past the herd at the next opportunity. Colville, is the northernmost town on the Peninsula, and our brunch spot was the only cafe here at Colville, aptly named the ‘Colville Cafe’’ which is right next door to the Colville General Store and opposite the Colville School., Don’t expect any fancy cafe fare and huge variety on the menu, this is just good ol’ country kitchen, home-made food. The coffee though is pretty marvellous, hot and strong and was just what we needed. 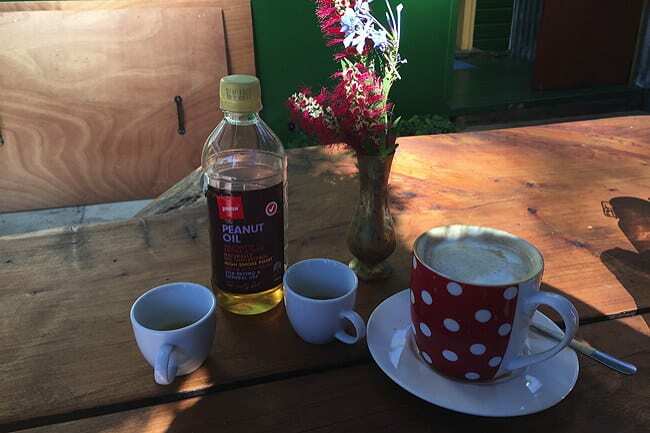 We made sure also to have our little tipple of Dave’s “Peanut Oil” tonic to warm us up for the day – a great way to take it is to follow it down with a mouthful of hot coffee which has the wonderful effect of disbursing the warmth of the tonic even more…..hmmmmmm yum. Brunch at the Colville Cafe, along with a little Peanut Oil Tonic! 29 kms and approximately 50 mins drive (by car), I’d only travelled this road once before. My journey was over 10 years ago and in a car with a very anxious passenger – the single lane gravel road with cliffs down to the sea on one side and embankments on the other had made it quite an “ínteresting’ experience in itself. I just knew today, that it would be SO much more this time around and I was right – it was the bestest bit of road on this adventure ! The perfect weather of course played a part by giving us 100% visibility out from the coast across Hauraki Gulf. We had amazingly clear views of Kawau, Little Barrier and Great Barrier Islands. These were double ‘wow wow’’ moments and it made me realise how grateful I was to my angels for throwing Dave and I together and to him for introducing me to the world of adventure motorbikes. Being on a motorbike on perfect days like this awakens your senses…., you feel the sunshine on your body, you see more (especially for me as a pillion passenger and not needing to keep my eyes on the road!) and you smell more. One of the top 10 Motorcycle sayings (www.motorcycle.com)…. En-route we pass a group of adventure bike riders returning from Port Jackson – everyone does the wave to each other which seems to be the ‘çode’ amongst fellow riders. I kinda picked that these were adventure bikes (as opposed to road bikes) but was definitely not clever enough to pick the model of bike but Dave said they were KTM 1190R’s. A little further along we stopped off at an old stone wharf which was jutting out into the Hauraki Gulf and I felt the need for an artistic moment for some photographs of Dave and his motorbike. So it was off the bike, taking a bit of a walk around to my vantage point and giving Dave his instructions via the helmet inter-phone. I quickly realised what fun this was as I could communicate exactly where I wanted him to pose, how to stand, hand gestures, etc and he obliged accordingly. My creative pic of the day was Dave on his motorbike parked on the wharf and framed by some overhanging foliage of a Pohutakawa tree. So back to our journey. The road was just getting better and better as it started to climbing higher and higher and the cliffs below us were getting steeper and steeper, wahoo! We arrived at the Port Jackson lookout point and stopped for photos, we had the bright blues of the cloudless sky combined with the rich green greens of the landscape and the intense deeper blues of the ocean.- wow what a view! We knew we were nearly at the very end of the road when we arrived at the gate at the top of Fletcher Bay campground – the gate opening/closing duty of course, being the responsibility of the pillion passenger. After a quick look around the campground and noting the start/end point for the Coromandel Walkway from this side, it was time to leave this perfect spot. We thought that we’d definitely need to return one day, do the camping thing and discover the Coromandel Walkway but now it was time to face the fairly decent ride all the way South down to Thames. A seemingly quick ride back on the gravel returning to the asphalt road at Colville Bay, then a nice road through Amodeo Bay into Coromandel township. It was late afternoon and we’d planned to stop at Thames for an early dinner as we needed to refuel the bike as well. So it was one last blat on the fabulous coastal road down to Thames – this really is a scenic road and a great motorbike road accordingly to Dave. I was enjoying watching the sun getting lower on the horizon as we passed by the beautiful Manaia Harbour and little coastal settlements of Te Mata, Tapu, Waiomu just to name a few. Very soon after though we ran out of daylight and I was very much looking forward to getting into Thames. Arriving at Thames, we were on the lookout for a casual dine-in dinner spot that offered quick food which was not Indian, Thai or Chinese food. Nothing jumped out at us and a lot of eating places were closed so we decided to ask the service station attendant – she couldn’t recommend anything which was a little disappointing. So if anyone knows of a great Sunday night dinner option in Thames, let us know! Heading out of Thames it was about 5.45 pm – there was no wind or rain but it was dark and cold. It was at this stage I was very thankful for the inter-phones in our helmets – we were both hungry and starting to chill down and it was so comforting to be able to chat away about this ‘n that to help pass the time before our final stop before home. A stopover at the Miranda Hot pools would’ve been most welcomed but this would have us arriving home too late for a Sunday night plus we’d already had our swim earlier on in the day and our number one top priority at this stage was getting some food ! Our revised dinner destination was Kaiaua Fish and Chip shop, Kaiaua, meaning (Kai = to eat, and “aua” = mullet or herrings) so while we weren’t eating mullet or herrings, we were definitely enjoying a feast of very good fish and chips – some of the best fish n chips I’ve had! Kaiaua Fish and Chip shop is right next door to the Hotel which also offers great meals but if you wanted something quick, then this is the place. There is a dine-in area and an added bonus is that they are licensed so you can enjoy a beer, RTD or mini bottle of wine with your meal. Nice, friendly staff too. Last gear up for the day and putting on another layer of clothing underneath our bike gear for this leg of the journey – it was less than ½ hour riding and there we were arriving home at Bombay. It was nice to finally get out of our bike gear, shower, grab some trackies and cuddle up on the couch in front of the telly with a cuppa to warm up. I was still buzzing from the whole journey and while I was tired, there was no way I was relaxed enough to be able to sleep. The next day back at work, sitting at my desk analysing numbers, I was thinking how much of a sharp contrast this was to what I was doing the 2 days beforehand. The invigoration and fulfilment I felt from our action packed weekend covering 630 kilometres had me already excitedly planning our next adventure. 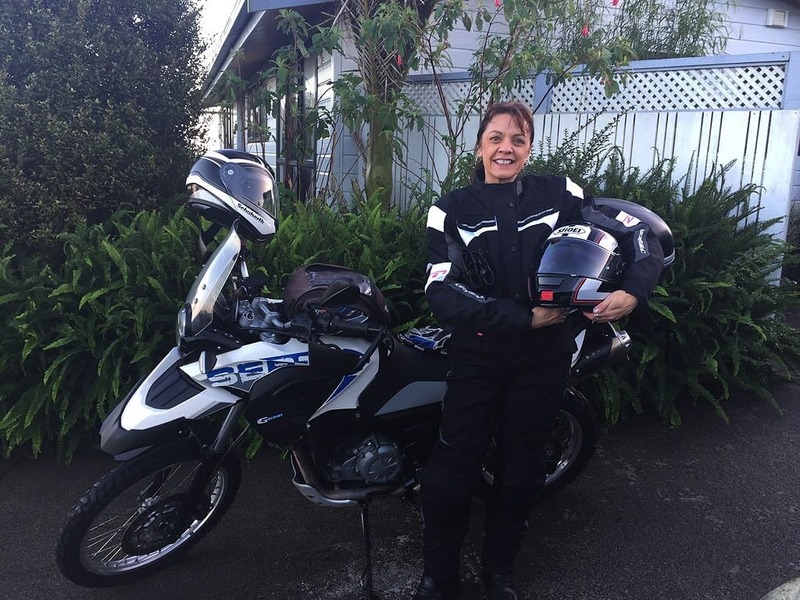 Having come from a non-motorbike upbringing, particularly on my Mum’s side of the family and my Mum having strong views about the safety of motorbikes, I’d been conditioned that motorbikes were “bad”. As the saying goes “don’t knock it until you try it”. From my weekend experience, I now totally ‘get’ how this is a big passion of Dave’s and I’m blessed to be sharing this all with him. Bring on the next adventure !! Check out the videos of Lynley getting her new adventure bike gear. 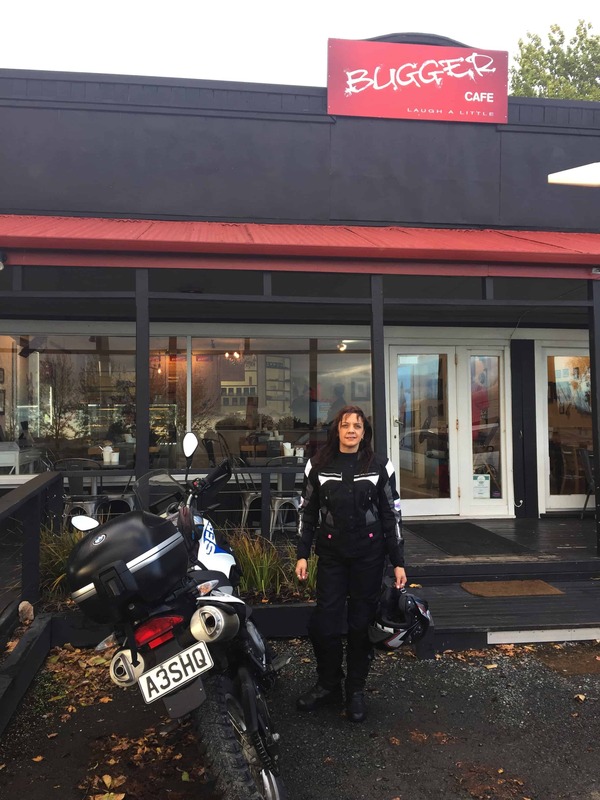 Lynley,is new to being on the back of an Adventure Motorbike so getting all her motorbike gear was a little bit daunting, however, thanks to the crew at Mr Motorcycles, it turned out to be a lot of fun.